This project was developed for a poster presentation at the Association of American Geographers (AAG) in Tampa, Florida of 2014. • Walmart is an American multinational corporation that has historically set the retail standard for large business growth and product diffusion. It is recognized as the biggest private employer in the world and has created its own system of distribution to keep up with high customer demand. Because of its versatility, Walmart has created Sam’s Club as a conglomerate to meet different customer needs. 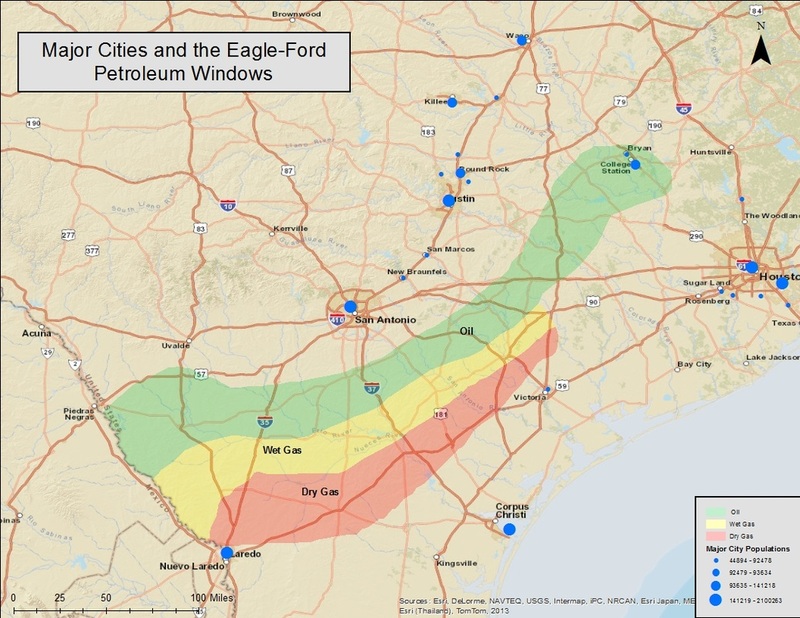 • The Eagle-Ford Shale is a geological formation found beneath 30 connecting Texas counties. 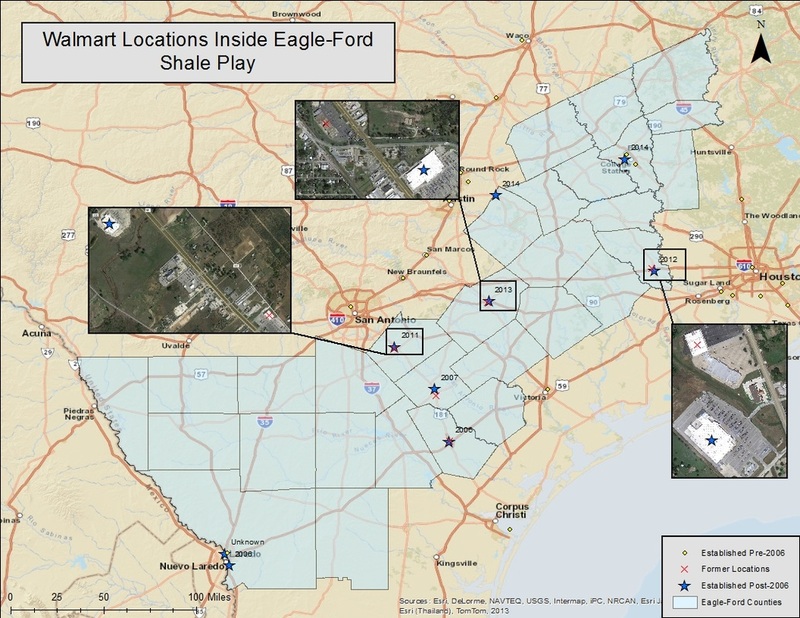 While this formation has been recognized by drilling companies for many years, the recent introduction of fracking technologies has given once inaccessible sites the ability for companies to move in and access the oil and gas beneath the ground. Popular drilling began in this region in 2006 leading an unprecedented energy boom in the largely rural areas. The counties involved are Atascosa, Austin, Bastrop, Bee, Brazos, Burleson, Colorado, Dewitt, Dimmit, Duval, Fayette, Frio, Goliad, Gonzales, Grimes, Karnes, La Salle, Lavaca, Lee, Leon, Live Oak, Madison, Maverick, McMullen, Milam, Robertson, Washington, Webb, Wilson, and Zavala. The formation is best known for its reservoirs of wet gas, dry gas, and oil. Because of the increasing amount of job opportunities, Eagle-Ford counties have a population and housing increase that continue to rise at a rate that is almost twice as fast as that of the United States; cities outside of the Eagle-Ford communities are also growing as a result. Of the twenty-nine Walmart and Sam’s Club locations in the Eagle-Ford counties, at least seven locations have received either a Walmart Supercenter or a Sam’s Club since 2006. Two sites in Nuevo Laredo (Webb County), one site in Elgin (Bastrop County), and one site in Brian (Brazos County) have all received a Walmart Supercenter since 2006. Sealy (Austin County), Floresville (Wilson County), and Gonzales (Gonzales County) all have replaced original Walmart stores in exchange for Walmart Supercenters since 2006. On average, Supercenters create 300 jobs for the local community which is about 85 more jobs than a regular Walmart. Old locations are in close proximity to new locations. These older facilities are repopulated with smaller retail companies, local food establishments, and other small corporations. Increases in population continue to be a driving force behind Walmart’s placement criteria. While many of these rural communities have mixed feelings about the growth of Walmart, it is certain that expansion of the company is sure to follow in this region.